I have built a good number of AR15s over the years both for myself and for others, so I have developed a healthy set of preferences. Recently, someone asked me about the build for a very specific AR15 that I had in a picture, so I figured I should explain a little more why I built it the way I did. In general, I have talked a little about basic component choices for ARs here. Before I get into the specifics, let me walk you through my reasoning for this build. This is my take on a general purpose 5.56 AR-15. It is not optimized for any one thing, but I want it to do everything an AR-15 carbine is supposed to do in a pinch, from CQB to long(ish) range engagement. For a 5.56 long(ish) range is out to 600 yards or thereabouts. What his means is the rifle has to be light enough for speed and balanced well enough for speed while still maintaining reasonable accuracy for longer distances. What was also an important consideration for me was that the barrel maintains consistent POI even as it gets a little warm. I put links with a bunch of components I like at the very bottom of this post, rather than embed links everywhere through the text, so if you want to see how much all these things cost, just scroll down. For the barrel to be consistent, it should not be a pencil barrel. I have seen plenty of ultralight barrels that are quite accurate, but they do warm up quickly, so I decided to go with a medium weight design. This one is from AR-15 Performance. They offer a good bang for the buck and I can buy their improved bolt already matched to the barrel. -Wylde chamber for best results with both 223 and 5.56 ammo. -4150 Chrome Moly with melanite treatment all over the place. Supposedly, it lasts longer than stainless, but I do not think I am in danger of shooting either one out any time soon. -Mid-length gas system: I tend to go with the longest gas system I can get in a barrel. Most carbine length gas systems I have seen appear grossly overgassed, so with those I prefer adjustable gas blocks. With most mid-length gas system barrels I get proper gas volume with simple non-adjustable gas blocks. AR15 Performance makes good barrels, but they are not the only game in town. 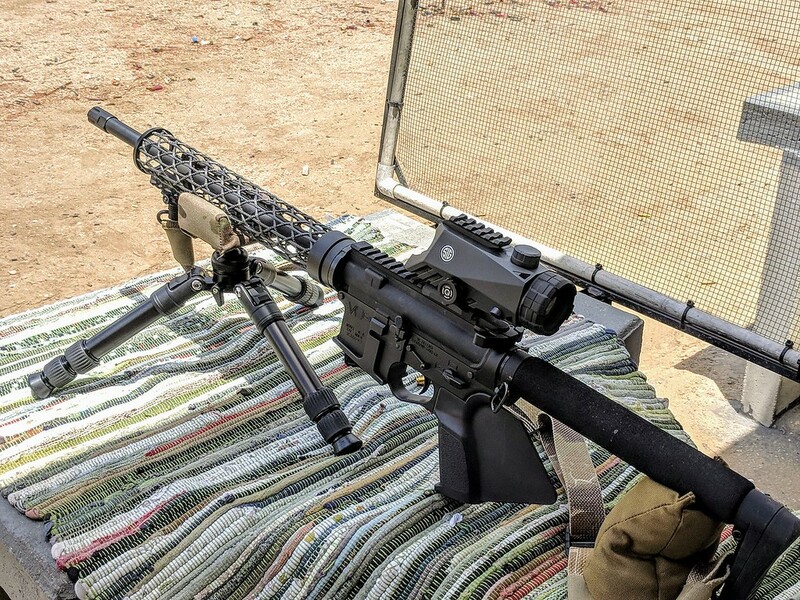 Given all the excellent options out there, I generally use AR barrels that are in the sub-$300 range and aside from ARP, I have been quite impressed with Faxon match barrels for the money, same fro Criterion Hybrid barrels. It hatd to go wrong with either one of these. For a little more money, Rainier Ultramatch is also very good (and a little prettier to look at). Basically, for this type of a build any 16″ barrel with a diameter in the 0.75″ – 0.80″ is fine. Speaking of gas blocks, this particular build has a simple set screw version that happened to fit this barrel very tightly. Generally, I prefer clamp on gas blocks like those from Daniel Defense and a few others. For ultimate precision or if the system is overgassed, there are many nice adjustable gas blocks out there, like those from Superlative Arms and a few others, but given a choice I use simple non-adjustable ones when I can. The bolt is from ARP, but the carriers I like are single piece ones from Voodoo. You can either buy just the carrier or the entire BCG. Aside from being one piece, they are also coated with something that makes them slick and easy to clean. All my builds going forward will be using these. They offer both standard and lightweight carriers. Use standard weight with non-adjustable gas block. If you are going with an adjustable gas block, go for the lightweight carrier. The charging handle is an ambidextrous affair from Radian called the Raptor. Being able to work the charging handle with either hand is important for me. The upper receiver is a standard Aero Precision piece. You can get exotic with these, but I usually do not. The lower receiver is from VC Defense which gives me ambidextrous bolt release. I often shoot with a sling, which keeps my support hand occupied. After a mag change, being able to drop the bolt back with the shooting hand is useful. LPK and trigger are from Geissele. It is SSA-E trigger in this case which is a very good option for general purpose use. The stock is the Ultralight from Ace which uses a rifle extension. This part is important since a rifle extension/buffer/spring seems to shoot notably softer than the carbine one. It is also very light, which helps me keep the balance point right under the magwell. This design also allows me to rotate the buttpad slightly which help with the precision side of things. Spring and buffer are absolutely standard. I live in California, so I have to use a finned grip, which is stupid, but must be done to comply with our crazy laws. The ambidextrous safety, like the charging handle is from Radian Weapons and it has two modes: 90 deg and 45 deg. I use a 45 degree set-up since that makes for a better thumbrest (California stinks).